The Changping District is full of farmland and orchards. It contains the Ming Dynasty Tombs, the peaceful complex where the 13 emperors from the Ming Dynasty were laid to rest. 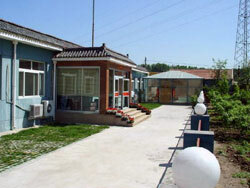 Changping is well-known for its numerous tourist facilities and beautiful scenic spots. Datangshan Museum, for example, is a favourite destination in the area. Partly located inside a cave on Datangshan Hill, the museum is China's largest homage to aviation. The site of the Ming Dynasty Tombs is also very popular with tourists. Embraced by mountains in an unsullied valley of quiet waters and rich earth, this vast area was precisely chosen according to Feng Shui principles as the final resting place of the 13 emperors. Only three of the tombs are currently open to the public.